I am looking for a bag to carry my 15″ MacBook Pro. I really don’t like reading all the comments so I consolidated all the links I found on the web. The only commentary I have on all the bag makers below is, I have owned a Brenthaven bag for nearly 5 years and I give it very high marks. people, products and services that make my attention efficient and effective. attention I receive from others and wish to make their attention efficient and effective. title to, access to and control of my attention artifacts. those who recognize that attention exchanges are and should always be symmetrical. So I just thought I would list out where some of my attention data is stored, definitely not an exhaustive list and not in any order. This list just screams opportunities for attention efficiency, forget paying me for my attention data just let me be more efficient with it. Where is your attention data stored? I invite you to create your own lists in the comments section or trackback your list. I am interested to see where all our attention data goes. A list of languages I have had to code in. The list is in no particular order. I thought I would update the list of best selling books at JavaOne. It was sad to see Ruby for Rails drop off the list. Looks like AJAX was a popular topic, taking 6 of the spots on the list. 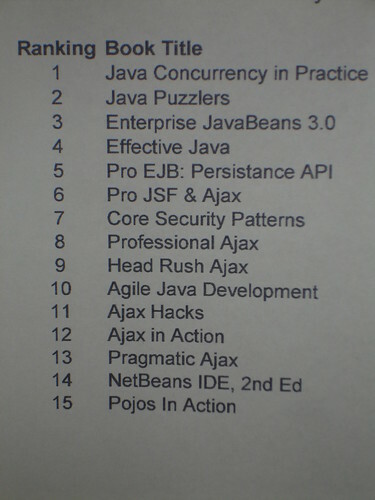 Most Popular Books at Java one, originally uploaded by TomC. I did some work on putting together a new interface design for an application. So, I thought I would provide my guiding principles. “Information becomes the interface”, Edward Tufte in Visual Explanations p.142. “OODA Loop” (Observation, Orientation, Decision, Action) By Col John Boyd, USAF (Ret). Information displays should strive to be no wider than 16 choices and 2 levels deep. To some degree the interface has to be stupid simple. The antithesis to this principle is demonstrated by some large ERP software vendors. Do as much work beyond view of the customer as possible. Icons are Iconic or they are not valuable.